just when you think the month can´t get any better.... Today I got the news that Rockabilly Ruhrpott will be broadcasted in TV. 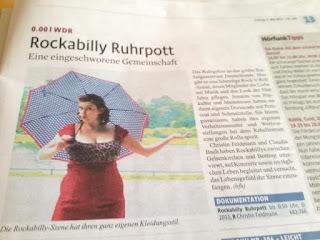 If you didn´t catch it in cinema, didn´t get round to buy the DVD and didn´t attend the directors cut screening maaaany years ago you can now see it TONIGHT on WDR at midnight. Oh!! Großartig! :") Danke fürs Informieren! !